Hawthorne Cottage01263 715779work01603 870304fax Self-cateringThis pretty thatched cottage dates from the early 18th Century and features both front and rear gardens, a warm and welcoming interior and a peaceful charm. Comfortably furnished, it has been tastefully decorated and has modern utilities. Only a short stroll from the beach, guests can also enjoy the selection of interweaving paths which are close by. This property is an excellent base to return to after a day out. • Other: Bed linen and towels, WiFi, Books, CDs and games, Telephone for incoming and local calls, 2 Travel cots, 2 High chair. Please note: steep staircases and low beams. • Reduced occupancy for four people in low season is available for £500 per week, using bedrooms 1, 2 and 3. 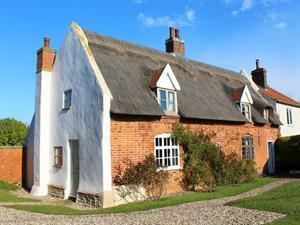 This pretty thatched cottage dates from the early 18th Century and features both front and rear gardens, a warm and welcoming interior and a peaceful charm. Comfortably furnished, it has been tastefully decorated and has modern utilities. Only a short stroll from the beach, guests can also enjoy the selection of interweaving paths which are close by. This property is an excellent base to return to after a day out.